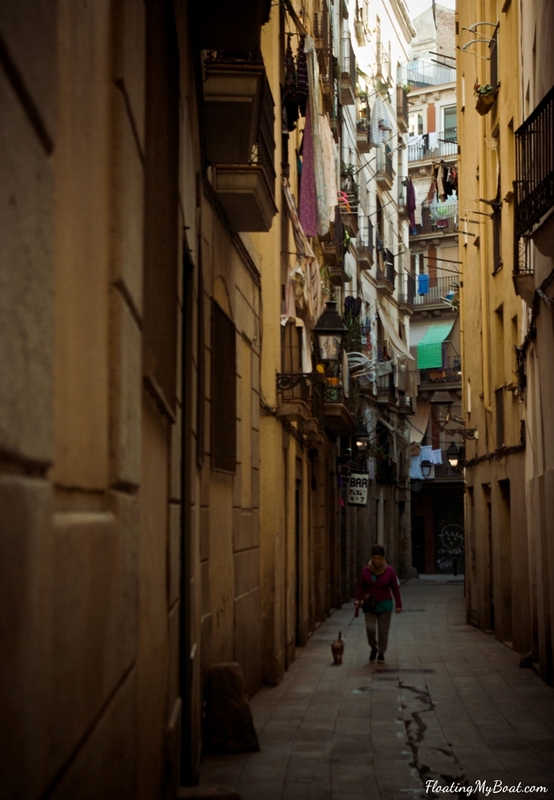 Barri Gotic in Barcelona is a quarter like nowhere else in Europe. High, dark, winding streets, cute cafes, plazas and an atmosphere of mystery. There are many things to do and see in Barri Gotic in Barcelona thanks to its rich and long history and a number or well-preserved historic sights. Barcelona is also this type of city that is made of very distinct and unique neighbourhoods. You are in once city, but as you wander from one zone into another, it feels as if you actually travelled between separate towns, each having its singular, inimitable style. Click here to read about my first day in Barcelona. Barri Gòtic in Barcelona was number one on my „must-see” list. 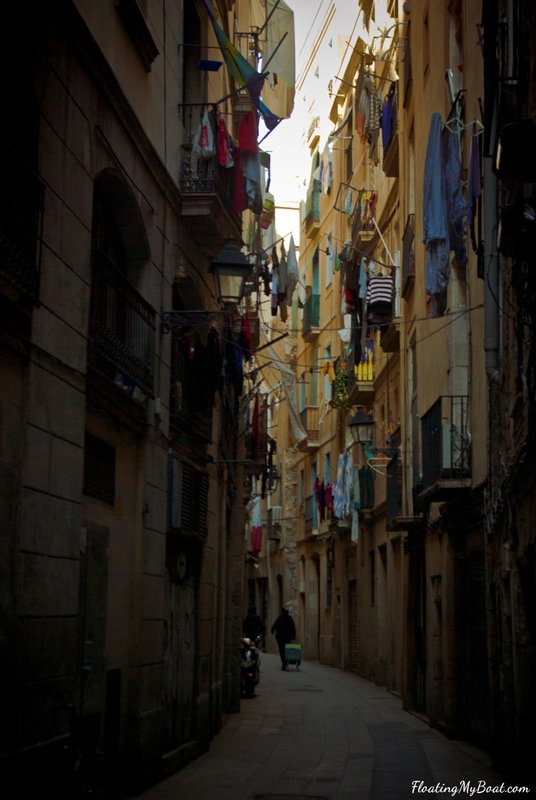 It’s no secret I am a big fan of narrow, atmospheric streets, but what I saw in Barri Gòtic exceeded my expectations. I first went there quite by incident on my first evening, when I took a turn from the crowded Las Ramblas. I didn’t even have to check on the map where I was, because the style of this neighbourhood is so outstanding and characteristic, you just can’t mistake it with anything else. It was already getting dark and the whole place seemed even more mysterious than during the day. Some of the narrow streets in Barri Gotic were dimly light and scarce passers-by were casting long shadows. I was walking without any plan, deciding on the spot which lane I like most and I suddenly found myself standing in front of a huge, impressive gothic building. It looked like a church, so I went inside. As it turned out, it was the famous Cathedral de Barcelona, known also as Cathedral de la Santa Creu i Santa Eulalia, one of the most important historic sights in Barri Gotic. It was erected in stages from XIII to XV centuries and the gothic spirit is totally tangible there. The feeling of space and greatness is so overpowering, I was feeling like an ant compared with an elephant. In front of the Cathedral de Barcelona, there is a cosy square bustling with life. I re-visited this place the next morning and, I must stay, it didn’t lose its charm in the daylight. I had my lunch on one of the benches and it was one of the pleasantest moments during this trip. Very close to the Catedral de Barcelona, there is a really magical place, Plaça del Rei. When I entered it, I instantly had an impression as if I travelled back in time and was about to see a decapitation in the middle of this square. It’s all made of grey stones, it’s rather small and closed by tall buildings on each side, which gave me this weird impression of travelling back in time. There was a girl playing the violin, a couple having a wedding photo session, and a group of tourists with a guide. By and large, it was quieter when compared to e.g. Plaça de la Seu and I really enjoyed spending some time there. From there I went to another church, the Basilica of Santa Maria del Mar, which is another stunning example of gothic architecture in Barri Gotic in Barcelona. It dates back to the XIV century and has one of the most beautiful groin vaults I’ve ever seen. The central nave is higher than the aisles and its interior is very austere. Apart from stained glass, there aren’t many other decorations. Only later did I find out that the basilica’s interior got nearly completely destroyed in a fire in 1936 and that’s probably why it looks so simple, yet so proud. Before I went to Barcelona, I had heard some good reviews of its food markets (fruta, verdura y carne hehe). La Boqueria is the biggest one and…. I deliberately missed it for the sake of the Santa Catarina one. It’s a lot smaller (as they say, I couldn’t really compare) and supposedly a lot quieter. Although I didn’t buy anything, I enjoyed a walk trough stands with everything from meat to books. There are two more palaces that drew my attention, but I will visit them the next time. These are the Jewish synagogue and Museu Picasso de Barcelona, which both looked stunning from the outside. Barri de Gracia has a completely different taste than Barri Gotic but is equal interesting and also less touristy. This is the neighbourhood that took me by surprise. I hadn’t known anything about it until I went there on the occasion of visiting the famous Parc Güell and it quickly became my favourite place in Barcelona. Barri de Gracia is colourful, it’s full of music, it’s flowery, and, what’s the best, there is a magnitude of small yet charming squares where you can sit and enjoy a good cup of coffee to the sounds of live music of street artists. It’s also less touristic when compared to the gothic zone and it’s also the most Catalan place in Barcelona. On my third morning, I was eating breakfast with the owner of the hostel who told me a few interesting stories. I asked him why there were so many anti-tourist posters and signs hanging all over the central Barcelona, starting in Las Ramblas, through La Barceloneta, to Barri Gòtic. He told me that due to a heavy increase in the tourist traffic in Barcelona, a lot of indigenous Catalonians are forced to move out of their homes located in the centre and move to the other zones or completely out of the city. Why? Because the demand for hotels and hostels is skyrocketing and honesty loses the battle against money. Barri de Gracia is still relatively untouched by this, meaning that the majority of people who live there, were born and raised in Barcelona. For a comparison, it’s only around 40% in the Barri Gòtic. Where is Barri de Gracia in Barcelona? Barri de Gracia is attractive also due to its location. It’s spread on the north of Barcelona on the hills and has great views over the rest of the city. It’s the place you would like to go on Saturday afternoon to spend some nice, lazy time. My absolutely favourite place there is Plaça de la Virreina. There are cafes with open air seats, some benches, a church, and a small well, where tired dogs drink water. I like this place also because I had my first Spanish-speaking test with a native there. I was sitting on a bench just watching life and there was a musician playing songs nearby. He was wearing a red shirt and a characteristic hat. He was walking around the tables of one of the restaurants playing the guitar and singing, but his music was not imposing. He was keeping himself in the background, thanks to which atmosphere was really laid-back and nice. Once he finished, he approached my bench and said a simple “Hola!”. I am very basic in Spanish, but I can totally say hello, so I replied “Hola!”. He then asked me the typical “Que tal?”, which was still easy to answer. To the typical “Muy bien” I even added a question “Y tu?”. He then said something in Spanish and I understood maybe a half of it, but seeing the big question mark on my face, he slowed down and asked where I was from. So far so good, I thought. I was slowly forcing my brain to use all the Spanish words I remembered and that’s how I got his story. He is from Ecuador but has not lived there for more than 20 years. He moved to Germany, Cologne, where he met a Polish girl called Kamila and they became a couple. It lasted about 10 years. Kamila taught him saying “Kocham Cię” which he eagerly demonstrated to me. 😀 After the break-up, he moved to the sunny Spain and lived in Barcelona for 8 years, but moved out to a small town located 100 km away two years ago. Then he asked me what I was doing in Barcelona and I replied that it was my birthday gift, to which he said that he was my birthday gift, which was very funny. (YO soy tu regalo de cumpleaños!). We chatted for about 20 minutes, he also told me about some nice squares nearby, like the Plaça del Sol and Plaça de la Revolución which I later visited. At the end of our conversation he said we could set up a company where he plays the guitar and I cheer, so that he gets more attention. This was a very nice encounter and I am particularly happy about it, because I really SPOKE SPANISH for the FIRST time ever with a native speaker. Although I didn’t understand his every word, I got the whole idea of what he was telling me, and these were a lot of things. So here big thanks to my Spanish teacher, Luiza, who made it possible.